I didn’t have the benefit of world-renown campus eateries like many colleges do. The program at our school was lacking excitement, and seemed expensive for someone not living in a dorm, so I decided I’d rely on the other nearby eats. The food trucks. This turned out to be a very smart (and lucrative) decision. The majority of trucks were more affordable and much more authentic. You could find just about anything, from freshly made falafel to hot breakfast sandwiches, savory crepes, or even some cookies (even at 1am). One of the trucks I visited most often was a burrito truck. Honestly, it was more of a cart, and I think someone towed it away every night. Somehow, two full-grown men cooked inside this thing – but the food they turned out was ridiculous. Sure, you had to get over their sweaty appearance, somewhat rude demeanor, and not really knowing where much of the food was prepped (their house? ), but the end result was phenomenal, and way better than anything I would of had from the mess hall. I always went with a chipotle burrito. Not Chipotle; chipotle…like the pepper. It was pulled chicken that sat in a succulent sauce all day, with sautéed, almost soggy peppers and onions. Some seasoned rice, black beans, and cheese. It was perfect. Courtney and I had been reminiscing about some of our street eats lately, so we decided to do our best to recreate this campus treat while putting our own spin on it. We made a poblano sour cream sauce as well to help cool our mouth from the heat of the chipotle peppers, and featured some really good Sartori cheddar to hold it all together. It’s a big, messy beast of a meal and we will be returning to this recipe often. Roast your poblanos straight on a gas range, or on a grill. Keep going until your peppers are crackling, blackened, and tender. Dice with a chef’s knife and set aside. Melt butter in a small sauce pan, whisk in flour and let brown for a minute. Stir in milk util creamy, season with salt and pepper. Add chopped poblanos, then slowly fold in your sour cream. Blend the entire can of chipotles in adobo sauce with 5 tbsp olive oil, salt and pepper. Use 2/3 as your chicken marinade and set the remainder aside, you’ll need it later. Marinate up to 24 hours. Saute onion and green bell pepper in a large saucepan. You can keep these on a low heat for a long time while you finish the rest of the recipe. You want these to caramelize a bit, and really reduce as much as possible. Grill your chicken. When done, remember to let it rest for 2-3 minutes so you let all the juices stay in those breasts. Then, use two forks to “pull” your chicken breast into a nice shredded pile. Add garlic to your onions and peppers and give it about 60 seconds, stirring to not burn. Then add your chicken, tomato paste, remaining chipotle sues, chicken broth, and salt and pepper to taste. You can add a little olive oil to give your mixture more of a nice glisten. Stir all together and get it smoking on medium high heat. Lay out your tortillas and compile with rice, beans, cheese, poblano sauce, and the chicken and vegetable mixture. Wrap tightly and eat promptly! Eat one, two, or make it a bowl. 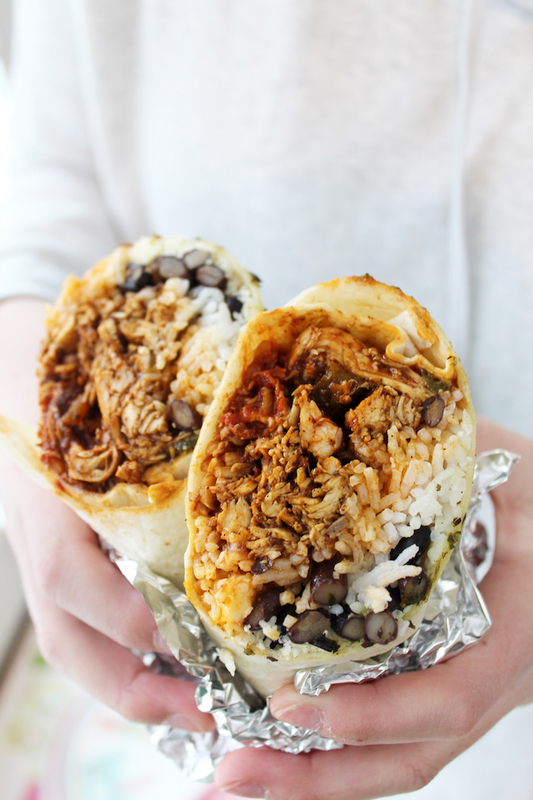 Drizzle your sauce over the burritos with a fork and knife if you’re fancy like that. There’s no wrong way to enjoy this meal.